In parts one, two, and three of this “Leak Testing 101” series, we discussed three methods of dry-air leak testing—pressure decay, differential pressure decay, and mass-flow leak testing—including the pitfalls and hidden costs inherent in two-step pressure testing methods and the higher accuracy of single point measurement mass-flow leak testing techniques. Is mass-flow leak testing always the best leak testing method? Absolutely not. When accuracy and cycle time requirements are not that stringent, pressure decay testing or differential pressure decay testing can be a better application match because test instrumentation does not require as much specialization and related cost. At the other extreme, when very small leaks of less than 0.01 standard cubic centimeters per minute (sccm) must be detected, helium mass spectrometer leak testing methods may be required. It is the only reliable method when an application requires detecting leaks as small as 10–4 standard cubic centimeters per second (sccs) or less. Sniffer—The test item is pressurized with helium and an operator moves a sniffer probe connected to the mass spectrometer to localize the leak. This method is slow, nonquantitative but has the advantage of localizing the leak. Accumulation—The test item is placed in a chamber and charged with helium. Helium leaking from the part accumulates in the chamber and after a certain amount of time, a sniffer probe checks for the presence of helium, i.e., a leak. While apparently inexpensive, this method has a number of shortcomings: presence of tracer gas from prior tests, lack of adequate circulation in the chamber, and long test times due to background effects. As a result, it will be difficult to provide quantitative testing with this method. 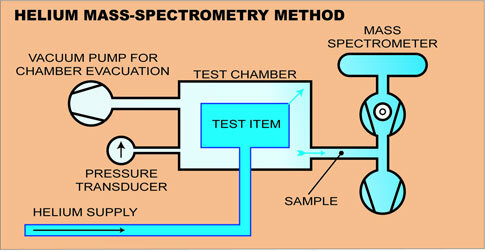 Vacuum leak testing with helium—Figure 1 shows how helium mass spectrometer leak testing proceeds. The part is pressurized with helium and the chamber is evacuated down to less than 0.1 mbar absolute to eliminate background effects. The presence of helium leaking into the chamber is then detected by the mass spectrometer. Figure 1: Test item is pressurized with helium within a test chamber. The chmber is evacuated, drawing helium out of the leaking test item. Mass spectromter then samples the vacuum chamber. Equipment costs, maintenance costs, extra time required to evacuate helium from test fixturing in between test cycles, and ever rising helium costs makes this method the method of last resort. Typical applications include: heating, ventilating, and air conditioning (HVAC) components; pace makers; aluminum wheels; and airbag components. For these type applications where leaks of 10–4 sccs or less must be detected for product integrity or safety, helium has its well-deserved place in the repertoire of best-match leak test techniques to consider. In the next part of this Leak Testing 101 series we will discuss miscellaneous other testing techniques including: hydrogen ultrasonic, bubble testing, and air under water. If you would like specific questions on best practices for leak testing (and other testing topics) answered in future articles, please send me your questions at jhoffmann@intertechdevelopment.com. This method is similar to simple pressure-decay testing discussed in part one.A more accurate variant of the pressure-decay method, differential pressure testing involves pressurizing a reference volume along with a test part. The pressure differential between the non-leaking reference volume and the test item is then measured by a transducer over time, as shown in figure 1. This method requires measuring pressure at two points in time to obtain a pressure change reading. It is an indirect method of measuring leakage rate because the time and pressure data must be converted into leakage rate. This method allows you to use a higher-resolution pressure transducer. Figure 1: With valves 1 and 2 open, the test item and reference volume are pressurized and then isolated by closing valve 1. The reference volume is then isolated from the test item by closing valve 2. The transducer reads the pressure differential between the reference volume and test item twice over time. A down side to this method is that the larger the volume, the smaller the change in pressure for a given leak rate, resulting in longer test times as test volume increases. All temperature effects are the same as for pressure decay. Differential pressure-decay testing is widely used. Unfortunately, in many instances it is the default choice of manufacturing and quality engineers who don’t understand the true cost of this type of testing. They could eliminate these hidden costs by using mass-flow leak detectors, another dry air-leak testing method that will be discussed in part three. Moreover, the indirect nature of the test process and the time needed to track pressure changes and take two measurements create inherently longer testing times. This means a greater probability of measurement error exists than for methods that require only one measurement. The probability of measurement error is directly related to the interval length between the two measurements. These factors are what lead many technicians to use mass-flow leak testing. That said, it should be noted that for many applications at pressures in excess of 150 psig, differential pressure-decay leak testing remains the method of choice. Granted, test cycle times are slower than with single-measurement leak test methods, however, this drawback is outweighed by the lower costs for instrumentation. Basically, choosing between pressure decay or differential pressure-decay test methods involves a trade-off between cycle time and instrument cost. In part three of “Leak Testing 101,” we will discuss the mass-flow leak testing method: how it works, and the pros and cons vis-à-vis helium and pressure-decay testing. I’ll explain how to implement this technique to get accurate gauge repeatability and reproducibility (R&R).